BOSTON, MA -- The NHL’s All-Star Weekend is in the rear-view mirror and trade rumors are heating up. As we see each season, some teams are on the stairway to heaven that is the Stanley Cup playoffs, some are on the highway to hell that is better known as the end of the season, while for others, life is a highway and their future is not yet known. Now that the All-Star festivities have concluded, teams will be turning their focus on whether they will be buyers or sellers on or before the NHL’s Trade Deadline, which is slated for February 25. In Boston, unless the Bruins suffer a total collapse (and with the recent successes of the Red Sox and Patriots, it would be best for that to not happen), it looks like the Bruins will see action in the postseason with Coach Bruce Cassidy’s club hovering in and around third place in the Atlantic Division throughout the season. Despite having a record that has been among the top 10 in the League on a consistent basis, the Bruins have just five players (David Pastrnak, Brad Marchand, Patrice Bergeron, David Krejci, Torey Krug) who have registered over 30 points on the season. However, after losing leads in each of their two games after the All-Star break, which resulted in overtime losses, it is becoming more evident that on most nights, if opponents shut down the line of Marchand, Bergeron, Pastrnak, their odds of defeating Boston increase. The feeling around town, if not the entire NHL, is this has become a one line team that has talented forwards who have trouble putting the puck in the net. For this obvious reason, Boston will be a buyer on or before the deadline this year. The Bruins’ second line has Krejci centering Jake DeBrusk and the wing du jour on Krejci’s other side. DeBrusk has shown that he can take advantage of Krejci’s playmaking abilities by scoring the occasional big goal but the 22-year-old would be better suited using his speed and physical brand of play to get pucks to Krejci who, in turn, can use his puck handling and passing skills to create scoring chances with a winger who has a history of being a goal scorer. This is where Bruins GM Don Sweeney will need to use his shopping skills to acquire a forward to fill that role with Krejci and DeBrusk. Sweeney thought he had done that at last year’s deadline when he traded for Rick Nash only to see a concussion, suffered during last spring’s playoffs, force Nash to retire this season after he was unable to return from the injury. This year, Krejci has seen nine different players patrol the wing beside him in 51 games. It is time for some stability on that unit. 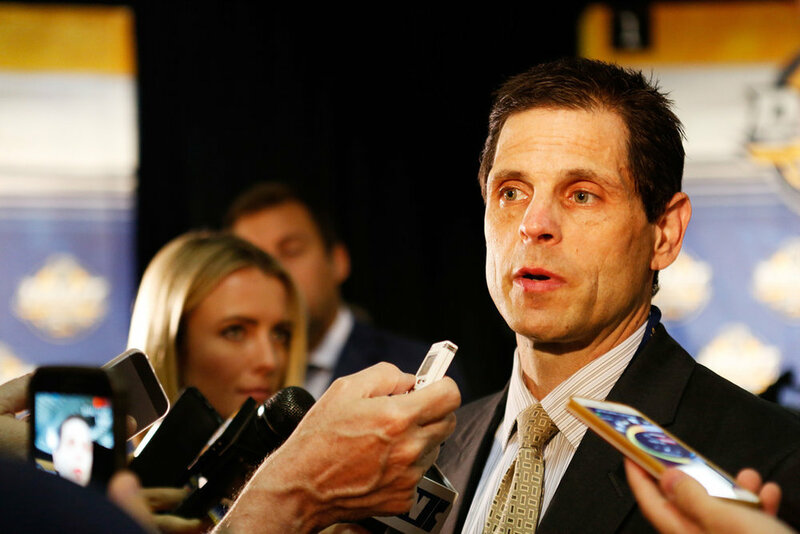 So, who are the Bruins hoping will be the perfect fit in the lineup? According to The Fourth Period’s Top 30 Trade Watch List, Boston has been keeping its eyes on Artemi Panarin (Columbus Blue Jackets), Jeff Carter (Los Angeles Kings), Wayne Simmonds (Philadelphia Flyers), Mats Zuccarello (New York Rangers), Ryan Dzingel (Ottawa Senators), Brayden Schenn (St. Louis Blues), Michael Ferland (Carolina Hurricanes), Tyler Toffoli (Los Angeles Kings) and Jakub Silfverberg (Anaheim Ducks). Attractive names with strong bodies of work, but before you propose sending a draft pick and a prospect for any of those players, be aware that according to several NHL professional scouts, the asking prices are high this year. Most teams are looking for a first or second round draft pick, a top six forward or top four defenseman off a club’s roster, and/or a top-ranked prospect in return for a player on the above list. More importantly, when a team trades for a player, it has done a lot of research to be sure the player will fit into the culture of his new club. A player might have the potential of scoring 50 goals but if he is not liked and/or respected by his teammates, you can be sure general managers will shy away from that player. That is not to say this is the case with any of the players on our list. What it is saying is that, an individual’s character is just as important in trading for him as is his on-ice numbers. Naturally, let’s not forget about the salary cap. According to CapFriendly, Boston presently has $11,388,027 in cap space. If there is one person in Boston who does not want to see Artemi Panarin (5-foot-11, 168-pounds) in a black and gold jersey, they have not stepped forward. The 27-year-old right shot left wing is at the top of everyone’s wish list and why not, in 291 NHL games, he has accumulated 290 points on 108 goals and 182 assists. This season, he leads a very good - perhaps Stanley Cup contender - Columbus Blue Jackets with 57 points (20 goals, 37 assists). The native of Korkino, Russia is in the final year of a two-year contract that carries an annual average value of $6 million. The big question is, are the Blue Jackets seriously considering moving their star player? The club is battling for an Eastern Conference wild card playoff spot. Columbus management has a little over three weeks to decide whether to pull the trigger on a deal or hold onto Panarin but they are leaving no stone unturned and have had their scouts attend Bruins games on a regular basis since the Christmas break. Word is, Columbus offered Panarin to Boston at the beginning of the season, but Sweeney nixed the deal when Blue Jackets GM Jarmo Kekalainen asked for DeBrusk and Charlie McAvoy in return. You can be sure that if DeBrusk and McAvoy were not going to be dealt then, they are not going to be dealt now. Jeff Carter (6-foot-3, 220-pounds) is enticing due to his career numbers and also the fact that he plays right wing and center. The Kings’ alternate captain has seen action in 953 NHL games racking up 697 points on 362 goals and 335 assists. Carter has three years remaining on his contract that carries an AAV of $5,272,727. While some in Boston have been quick to dismiss the 34-year-old forward because of his age, adding Carter – who is no stranger to winning with a gold medals at the IIHF U18 World Championships (2003), World Junior Championships (2005), and Winter Olympics (2014) to go along with two Stanley Cup rings – could compliment DeBrusk’s style of play and enhance Krejci’s goal scoring abilities. LA will not see postseason action. Now that they have traded defenseman Jake Muzzin for a first-round draft pick and two prospects, they are in rebuild-mode. This could be an instance where a young forward with NHL experience could be what it takes to land Carter. Kings scouts have visited Boston sporadically during the year, but have increased their attendance within the last two weeks. On the surface, Wayne Simmonds (6-foot-2, 185-pounds) appears to be the prototypical Bruin. He is a power forward who goes to the “dirty areas” where he wins battles for loose pucks, plays a physical game, and can score goals in bunches. In 812 career NHL contests, Simmonds has scored 241 goals and assisted on 226 others for a total of 467 points. The 30-year-old, right shot plays either wing and is in the final season of a contract which has an AAV of $3.975 million. His deal also includes a modified no-trade clause that allows him to submit a list of 12 teams to which he will not accept a trade. The Flyers have enjoyed a recent winning streak but they will need to go on a prolonged one in order to make a serious run at a wild card position in the East. Philadelphia may let Simmonds go for an attractive draft pick/prospects package along with a young player off an NHL roster. Flyers scouts have not made it a habit to watch Bruins games at Boston but that may change as the trade deadline nears. Mats Zuccarello may be 31-years-old, but he plays a lot younger. In the Rangers’ visit to Boston on January 19, all the speedy right winger did was assist on two goals, put three shots on goal, deliver one hit, and block one shot while seeing 21:06 Time On Ice which included 2:59 on the power play and 2:56 on the penalty kill. During the course of his 499 game NHL career, Zuccarello has posted 110 goals and 232 assists totalling 342 points. Ninety-six of his goals have come with the man-advantage. Contractually, the native of Norway is signed through the end of this season at a cap hit of $4,500,000. Although considered small in height at 5-foot-8, he packs 185-pounds onto his frame which enables Zuccarello to take physical punishment that is when opponents can catch the shifty forward. The Rangers are looking to go with a young lineup in the very near future. A high draft pick and a top prospect could entice New York to part with the veteran. Over the course of the last two weeks, the Rangers have been keeping a close eye on games in Boston. Three members of the Rangers’ staff, including Assistant GM Chris Drury, took in the tilt between Boston and Winnipeg on Jan. 29. Ryan Dzingel (6-foot, 190-pounds) is garnering more attention around the League as the season progresses. He can play all three forward positions and playing for an Ottawa team that is 20th in scoring, the Illinois native is third on the club with 20 goals. He has assisted on 19 others. His 39 points rank him third in team scoring but it is his .5 points per game during his three-plus NHL seasons that has more than one franchise calling Ottawa about his availability. In 239 career contests, he has amassed 121 points on 60 goals and 61 assists. At just 26-years-old and barring injury, Dzingel has plenty of hockey to play and he is only going to get better. He possesses very good speed which allows him to beat defenders to the outside with the puck allowing him to put over 100 shots on goal per season for the last two seasons. This year, he has taken 113 shots. Dzingel will become an unrestricted free agent at season’s end. His current deal carries a cap hit of $1.8 million. The Senators are another team that is in a rebuild phase and, on the surface, it really does not make sense for them to move Dzingel but if the right offer of picks and prospects comes along, they would be willing to deal him. An indication that Ottawa is looking to make a deal is that they have had more than one scout watching Boston on most nights this season. For a short period of time before Boston’s bye/All-Star break, there was quite a stir concerning Boston’s interest in St. Louis forward Brayden Schenn. The hype hit its crescendo when all of the Blues’ scouts were at TD Garden on the night of Jan. 17 when St. Louis faced off against the Bruins, however, one of the scouts told a colleague of mine and I that they were in Boston for organizational meetings. Since then the rumors of an imminent trade between the two squads have been all but muted. To be sure, Boston still has interest in 6-foot-1, 200-pound Schenn and managers from both sides were observed having conversations in the press box, but as of Feb. 1, nothing had materialized. Schenn is a left shot center/left wing which would add value since he could play on the Krejci line or fill Boston’s other need which is a center for their third line. In nine-plus NHL seasons with Los Angeles and St. Louis, the 27-year-old native of Saskatoon, Saskatchewan has compiled 345 points on 146 goals and 199 assists. Last year, he put up 70 points for St. Louis. He is no stranger to the power play having registered 119 of his total points with the man-advantage. Schenn has one year remaining on a contract that has an AAV of $5.125 million. The Blues are currently three points out of a wild card spot in the western conference which could be why most of the trade chatter has quieted. As the deadline nears, St. Louis management will need to decide whether to go all out for the playoffs or sell some of their assets in preparation for next year. Michael Ferland (6-feet-1, 217-pounds) has become one of the most sought after players by clubs looking to add a physical forward who is just finding his scoring touch. He can play either wing and that, combined with his age (26) makes him a valuable commodity in the League. After spending four seasons with the Calgary Flames, Ferland is in his first year as a Hurricane. In 42 games with Carolina, he has posted 13 goals and 12 assists for 25 points. Overall, Ferland has scored 55 goals while assisting on 59 others totalling 114 points in 292 contests. Ferland is in the final year of a contract that has a $1.750 million annual average value. At this point in the season, Carolina is a bubble team when it comes to qualifying for the playoffs. They are on the cusp of the second wild-card spot in the east. Every game is an important one for the Hurricanes and could decide where Ferland finishes his season. Tyler Toffoli (6-feet, 197-pounds) is another Los Angeles King whose name has been become more prevalent in trade speculations and rumors since the season began. LA is in full selling mode and is looking to clear Toffoli’s contract off the books with the focus on how to use the funds next year. That contract carries an AAV of $4.6 million per annum and will expire after the 2019-20 season. Like Ferland, Toffoli can play either side and in doing so, he has contributed 116 goals and 126 assists for 242 points in 425 games during his seven-year career with the Kings. For a player of Jakub Silfverberg’s size (6-foot-1, 204-pounds), it is somewhat uncommon to find someone who possesses the wheels that he employs in all facets of the game. He would give Boston a speedster up front to match their rivals in the Atlantic Division. The Ducks are in need of an infusion of young players and will become sellers as the deadline draws near. Presently, they are treading in the same waters as the Hurricanes when it comes to the postseason. Anaheim has won just two of its last sixteen games making a run at the playoffs less likely should they continue at that pace. Either way, they are need of changes from top to bottom. Silfverberg is in the final year of his contract with an AAV of $3.750 million. In six-plus seasons (two with Ottawa, four with Anaheim), he has produced 228 points on 105 goals and 123 assists in 461 career games but it is his playoff production that has teams clamoring for his services. In 69 postseason games, the 28-year-old native of Sweden has produced 45 points on 18 goals and 27 assists. Anaheim is making an effort to re-sign the forward but it would make more sense for the organization to move him for a high draft pick and a prospect or two and go into a rebuild phase. Boston is in need of secondary scoring and each player on this list will provide that for Sweeney’s club. Which player, or players, should the Bruins acquire? That has been, and will continue to be, up for debate among the club’s fans and the media that cover it but be assured whoever the Bruins manager brings to town will give the Black and Gold more offensive production leading up to, and during the playoffs. Perhaps, they will be a part of the Bruins for more than this year. Time will tell, but there are deals to be made and Sweeney will do what he believes will best serve his franchise down the stretch and into the Stanley Cup playoffs. If he is unable to do that, sports fans in Boston will turn their attention to the Celtics while anticipating more big seasons from the Red Sox and Patriots.